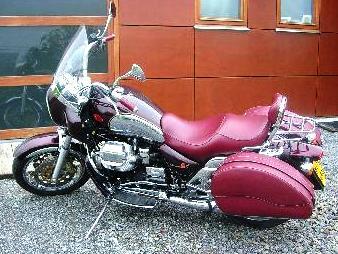 Mounting a top case, or trunk, to a Moto Guzzi California is an easy do-it-yourself project, especially if you already have a luggage rack like the California Vintage does. 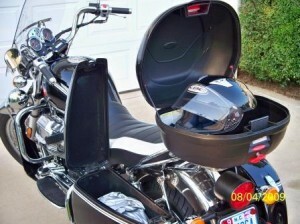 A good top case can not only enhance the look of your motorcycle, but can make it more enjoyable and practical. I like that the Vintage comes with a luggage rack, but I have not yet seen a back rest that will fit with it unless you make one yourself. To take care of two things at once, a relatively inexpensive solution is to add a top case that can also serve as a passenger back rest. You could also add a backrest pad onto the top case to make it a little nicer for your passenger if you want. 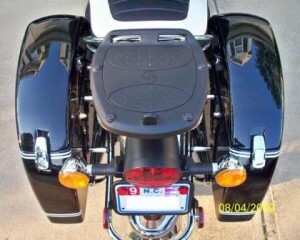 In this article, I’ll show you how I mounted a Givi top case to my 2007 Moto Guzzi California Vintage. The top case I chose is from Givi. I thought an Italian top case would be a perfect fit for an Italian motorcycle. I also chose this one because I liked the gloss black finish since that also matched the motorcycle. I just need to find a match for the Guzzi white pinstripes, but some reflective pin striping probably wouldn’t be a bad idea either. Unfortunately, the addition of the top case means you have to carry an extra key, so that’s three keys (the Givi key, the Southco key for the factory side cases, and your Guzzi ignition key). Oh, and don’t forget your house key, so that’s four. I wish one key fit everything, except maybe the house. The mounting plate comes with four steel clamps and the required washers, screws and nuts that allow you to easily clamp the plate to your luggage rack. There are several holes in the mounting plate, so it’s fairly easy to find four holes that will work best for your luggage rack shape. I wrapped the steel clamp pieces with black electrical tape so that these clamps wouldn’t harm the plating on the luggage rack tubes. There are better things to use than electrical tape, but it has worked well for about a year now and has not worn through yet from vibration and normal wear and tear. 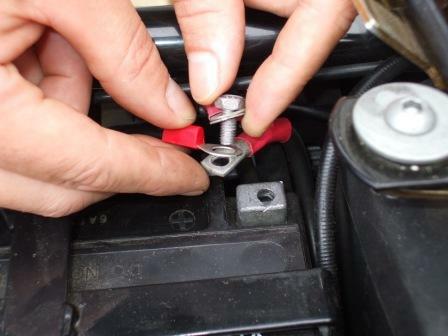 You’ll need to occasionally check the clamp screws to make sure they have not loosened over time from vibration. I use lock nuts that have nylon inserts in them. I found that I have to snug them up every now and then, but there’s nothing unusual or annoying about that. There is a cosmetic piece that snaps into place on top of the mounting plate to cover the clamp screws and the honeycomb-like ribbed structure of the injection-molded mounting plate. That cosmetic cover uses two very small philips screws that secure it down tightly against the plate, which is nice, but the cover stays on without any problem by itself. 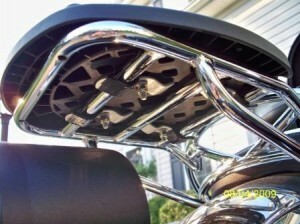 The idea of the mounting plate is that it can stay fastened to the motorcycle at all times. You can add or remove the top case whenever you feel like it. It just clicks and locks into place on top of the mounting plate. I don’t really care much for how the mounting plate looks without having the top case, as compared to the chrome-plated luggage rack, but it’s not all that unattractive, it’s black ,and so I guess it’s really not that bad. Sometimes I go ahead and take it off when I want the chrome to shine, and it’s only about a 10-minute job to just to fasten it back on again later. You could also strap things onto the mounting plate if you want, even if you don’t have the top case installed. The side cases on the Moto Guzzi California Vintage hinge upwards toward the front of the motorcycle. They swing up and from the rear. A single-helmet top case such as this one, rated at about 25 to 35 liters in size should clear the side case lids when they are opened all the way. The Givi E350 that I use is rated at 34 liters. You can fully open the California Vintage side case lids without any problem with this Givi top case on the bike. Typical Moto Guzzi California side cases (not on the Vintage) are removable and hinge open at the bottom out from the side of the bike, so clearing the top case is not an issue. Since the California Vintage side cases are not intended to be removable, it might be good to find out how far you will be able to open them if you want to put a larger size of top case on the bike. Givi has what they call their monolock system. That just means there is just one lock and key that locks the case shut as well as locks the case to the motorcycle. Well, it actually locks the case to the Givi mounting plate that you’ll need to fasten to your luggage rack. I find the Givi monolock system very clever and extremely convenient. A small, but nice touch is that the Givi key is ergonomically shaped and has a soft red covering on the grip. It’s easy to use, easy to find, and easy to turn with cold fingers. Even though my top case came with instructions from Givi, it tool me a while to figure out how to actually lock it shut. 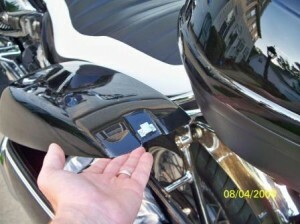 To lock it, you put your key into the lock, close the lid, and then push the latch inward (it says “press” on it) towards the front of the motorcycle. Once the latch is pressed all the way in, it stays there and you can turn and remove the key. It is incredibly easy and the lid stays locked nice and snug. 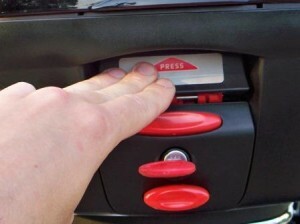 To open the lid, just insert and turn the key, then push the upper red button. 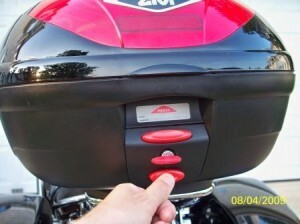 To unlock and remove the top case from your motorcycle, you use the same key in the same lock, but instead of pushing the upper red button, you push the lower red button instead. You need to give it a firm push. The top case can then be lifted right off and set aside. On my Givi E350, there isn’t a handle like on traditional Moto Guzzi top cases and side cases, such as on a California EV Touring. Givi offers a tail light kit that can be added to the inside of top case by tapping into the tail light wire on the motorcycle. I do not have that kit on mine yet, but I like the idea. I’m considering making my own light kit for it using bright LEDs. Givi also offers a backrest pad that you can add anytime. I bought my Givi top case from my local Guzzi dealer when I bought the motorcycle new. Adding the lights and backrest pad to my top case has not been very high on my priority list, but I’d like to have those someday. The E460 is a very nice looking top case and must look great on your Vintage with the added pinstripes. If I rode with a passenger a lot, I’d probably get a larger top case like yours and solidly mount it too. I notice very slight play with mine relative to the mounting plate if I nudge it enough. I could easily imagine that play being magnified by a wider top case if the passenger leaned towards one side or the other if the mounting plate is not larger to compensate for the additional width. My wife never rides with me because of her back, and our children are young, so the small case and the quick release mounting still work perfect for me. Thanks for visiting! I also added a Givi topcase to my Vintage, but found it to be a little too loose where it connected to the quick-release plate. My wife experienced some discomfort as a result. In the name of marital happiness, I direct mounted my gloss black E460 to the rack using large washers made of aluminum and the Givi mounting clips. The result is a much more solid feel and a slightly lower case…both improvements over the standard arrangement. Also, I added some white double-line pinstriping tape to the lid to integrate the case with the rest of the bike’s look. 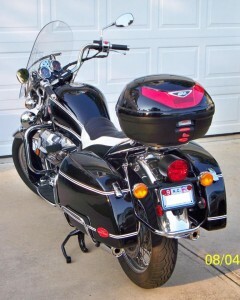 The E460 is a little wide, but the nylon hinges on the saddlebags have ample flexibility to allow the lids to open fully. The bigger case allows two of us to stash our helmets when we arrive at our destination. Props on a great website. Our CalVins (and other Calis) deserve no less.